Partnering with the St. Clair Butterfly Foundation on another art therapy project allows the students to use their creative talents and have a chance to get away from academics to use thier minds in another way. The Creative Arts Center brought art materials to our location to inspire our students to be creative and find solace in their time spent with art and design. We are pleased at Madison Prep to know that our students have an outlet and a tapestry in which to display their creativity. 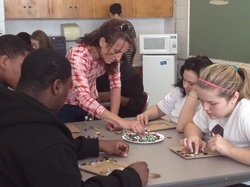 The founders of the St.Clair Butterfly Foundation and an instructor from the Creative Arts Center were key in bringing opportunities for our students to find creativity and relaxation with the mosaic art project. 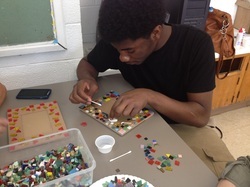 A student works hard to create a mosaic pattern on his picture frame. All materials were provided by the Creative Arts Center. Students work with Foundation volunteers and Board of Directors who come to work and share time with the students! Their support and positive modeling are key in giving our students a sense of meaning and importance. Prep students display their proud works of art! 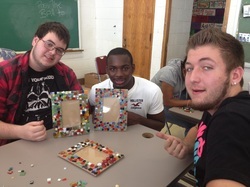 Mosiac picture frames are theirs to keep as a work of art that they created.